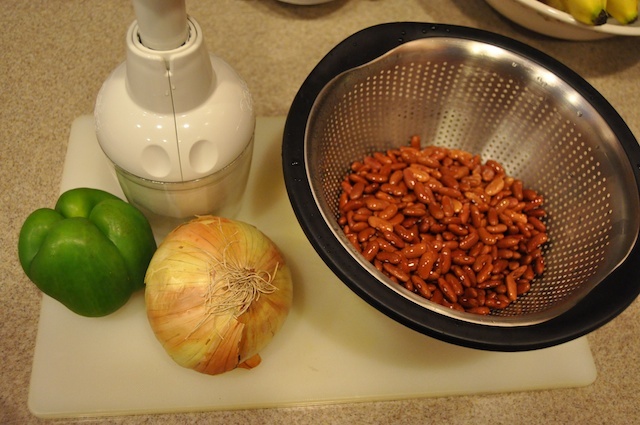 My mother-in-law told me an easy recipe for making red beans, and we’ve cooked this recipe several times (even before the Real Food Pledge). You throw everything in the pot and cook it half a day. You don’t even have to soak the beans ahead of time. Cut ham into cubes. Chop onion and bell pepper. Add ham, onion, bell pepper, and dry beans to the pot. Cover with water about 5 inches deep. (I use 8 cups of water.) Start cooking on medium heat for about 10 minutes. Add bay leaves. Turn the heat down to low and cover. Cook for 4 hours. Add salt and pepper and garlic powder to taste. This entry was posted in real food, recipe. Bookmark the permalink.